NOAA’s Storm Prediction Center have now finalised their tornado data for 2015. The year finished with 481 tornadoes of EF-1 strength or greater, the fourth year in a row that has been below average. Perhaps more significantly, the number of EF-3 and stronger tornadoes was one of the lowest on record. You have to go back to 1987 to find fewer. There were no EF-5s at all, and only three EF-4s. 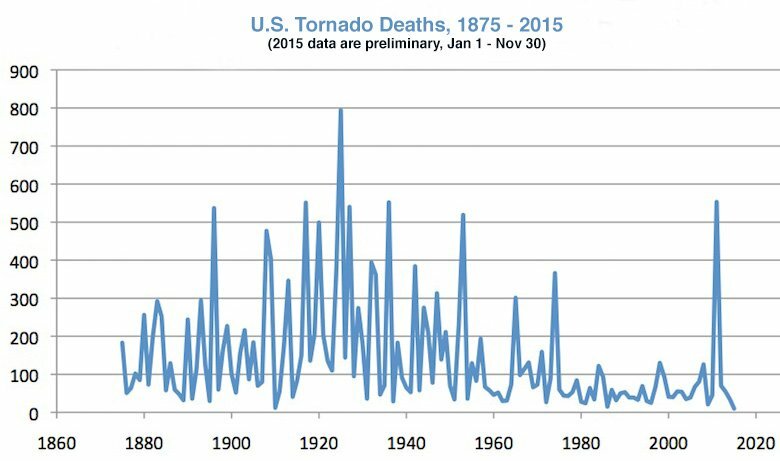 2015 will likely end as the least-deadly tornado year on record in U.S. Extreme Weather Expert Dr. Roger Pielke Jr.: Despite claims of ‘warmest ever’ – 2015 ‘had the lowest catastrophe losses in a generation’ – “It’d be great if just one journalist (any!) would note that 2015 — warmest year ever — also had the lowest catastrophe losses in a generation,” Mr. Pielke said on Twitter.